Earth Overshoot Day was August 2, the earliest Earth Overshoot Day ever. This is the day when humanity’s consumption of natural resources officially passes the planet’s ability to replenish then in one year. If humanity lived sustainably on Earth, then Earth Overshoot Day would be at midnight December 31, meaning we would not have consumed more than the finite resources the planet provides for us. This is why the metaphor of Earth as a spaceship is the highest and best way to think about any aspect of climate change, sustainability, energy use and anything relative to the only place we have to live. Think of any context of the word spaceship in your life. In all cases it is a vessel traveling through space with a crew and finite resources to undertake whatever the mission might be. The crew must live within the limits of the spaceship’s resources if there is no resupply to be expected. If the crew lived well beyond the on-board resources it would be immediately clear that the mission would have to be aborted or that the crew would have to compensate and live on less than planned until equilibrium was reached. Currently humanity consumes 1.7 Earth’s worth of resources every year. That simply cannot be sustained. This is why the definition of the word “sustainable” can only now have meaning on a planetary level. Humanity is not living sustainably until we get back to 1.0 planet’s worth of renewable resources consumed in a year. The last year that Earth Overshoot Day was not earlier than December 31 was 1970! That means that for the last 47 years humans have consumed more than the planet could replenish. We at ThisSpaceshipEarth.Org have posted the chart tracking Earth Overshoot Day within an explanatory article by Bob Leonard here. Tim Rumage, Co-Founder and Chief Science Officer of ThisSpaceshipEarth.Org – and my co-author of This Spaceship Earth, has been focused on Earth Overshoot Day for years. Here is his commentary posted on August 2, 2017. Some of the statistics in his column may alarm you. In addition, the folks at Global Footprint Network provide a way for you to do your personal overshoot day computation. They also have a lot of good information on the topic. The compounded reality is that we have lived beyond planetary means for so long that we must not only get back to 1.0/December 31, we must resolve to see if we can move that date back into January, if not February for recompense for operating This Spaceship Earth in the red zone for so long. 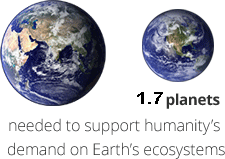 The collective goal for humanity is to move Earth Overshoot Day back each year. We at ThisSpaceshipEarth.Org are committed to creating crew consciousness, which leads to crew thinking and then crew actions. Our long-term goal is to recruit 1 billion crew members. If there were even a fraction of that number acting as crew with the common goal to move Earth Overshoot Day back we could have a collective success. It is through acting as crew that we can work together to mobilize and crew our spaceship back out of the red zone it has been operating in for so many years. Facing climate change is not about “saving the planet”, it is about saving ourselves from ourselves. The planet will be around for another 3 billion years and doesn’t need saving. We need to save ourselves. Starting now! Having Earth Overshoot Day be August 3 next year would be a small but significant accomplishment. Let’s do it!